I have removed the YouTube Channel “Make” as this was an amalgamation of a lot of popular woodworking youtubers. There has been an explosion of Woodworking YouTubers in recent years. I am constantly discovering the channels of incredibly talented woodworkers of all ages and backgrounds from all over the world. From small modest work spaces to large well established and well equipped workshops, there really is something for everyone. You’ll find here, quite a comprehensive list of YouTube woodworking channels, and I must thank the woodworkers of reddit for helping me put this list together. 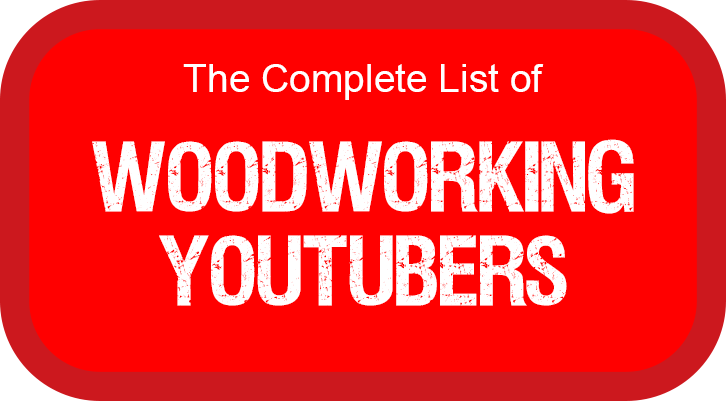 I did originally decide decide that a channel needed to have a minimum of 1000 subscribers to be included on the list but after a lot of feedback I decided to include every channel that was sent to me (as long as it was woodworking themed). There were a couple of channels (Clickspring and Inspire to Make) that were on the list that I have removed because they weren’t strictly woodworking, but still do think that they are definitely worth checking out. The next thing to look at was how to order the list. Probably the most obvious was subscriber count (which is how it is ordered), video count was also a possibility. One thing I was looking at, was the subscribers to video ratio. For example the Channel Inspire To Make has 101,000 subscribers, but when you realize that they only have 20 videos, the subscriber to video ratio is very impressive. I really do recommend you check it out as the videos really are very well made. I also wanted to highlight a couple of channels that I really enjoyed whilst putting this list together. Get Hands Dirty is the woodworking channel from Cristiana Felgueiras, a woodworker (and musician) from Portugal. The quality of the filming and sound is very good and definitely one to watch out for in 2016. Alex is from Johannesburg and only started his channel in January. It’s not a dedicated woodworking channel, but there are some cool videos like this Old School Skateboard and Recycled Wooden Penny Board. This video is really well filmed and shows what you can do with limited tools. I plan to update this list once a month and I am sure that I will have missed some channels. If there is a channel that you feel should be on the list, please let me know and I’ll get them added. If you have started a woodworking channel, please let me know so I can add it to my subscription list. Also if you notice that I have missed a channel that you think should be on the list, please let me know and I will get it added. Hi James , any chance you could add my channel ? It’s NZ Woodturning . Hey there. Great list. I e got a woodworking channel. Currently at 4,293 subscribers. Give it a look. If you like it if love to be on your list. Great list by the way. Lots of new ones I’m not familiar with. Cool Stuff! Great to see a list of so many creators in one place! I find your list to state complete is an anti support of those that don’t have a thousand viewers. Change it to read the top 100 or whatever it is not ever complete. I don’t know if you have to havr a minimum number of subscribers to be listed, but I have a small YT channel I’m trying to grow. I haven’t yet hit 100 subs. If you’d like to check it out it’s at youtube.com/knotheadscny. Thanks. I’d like to be added to your list. My channels URL is above. Thanks! Great list, impressive documenting. Brian McCauley is missing. He has almost 4,000 subs. He may be beyond that now. I am not certain. Also, Braxton Wirthlin of Timber Manufacturing and Shawn Stone of Stone and Sons. Those are just 3 I didn’t see listed above. Thanks Sean, Subscribed to those now and will get them added. Great channel by the way! You don’t have hffcom on your list. He does fantastic woodworking and has some great inventions. His name is Mitchell Rudman (sp?) Hffcom is his YouTube channel. hello. My name is Luiz ZACCARO. I am from Brazil. I am youtuber. I make a video about woodworking and I follow American woodworker. Could you add my channel in your list. Follow http://www.youtube.com/user/ luizzaccaro . Thank you. Thank you very much for making this list. Great list !! I dont have a large amount of subscribers, but I try to join in and still having fun. I do a fair bit of woodworking on my channel. Wow, thanks Karol, I did miss a few didn’t I! This is a fantastic resource, how you’ve manage to compile such an extensive list! I also have a channel, although woodworking videos are less frequent than they used to be (sorry, can’t seem to post the link from my phone). Would be great to see how many spots someone increases or decreases as time goes on. Wow, what a list! Can you add me? I think you missed http://www.youtube.com/ontheworkbench though not quite as many subscribers as the others on the list but some neat tool mods and other random tool talks. I dont think this is a complete list……I know Im not on this list and Im sure there are others like I didnt see Sterling Davis!! could you add world of woodcraft.. I have 35 subs and 6 videos. I also do instructables. I’d also add Ben Brandt, Bales, and SDM Custom Woodworking. I so appreciate this list – great idea, great resource for those of us who love woodworking! My Husband is Shane’s Hobby Shop and he already is on your list, so you see, even tho I do have other diy items attached, woodworking is most definitely an ongoing part of my show. I only have one official episode out, but this week I will be posting episode number 2…this will feature PART 2 Of my Cracker Platter that I built with Shane, as well as my OWN Version of a Wood Conditioner that I have created that I will be using on Shanes Potato Bin that he built and I will be going over the ingredients used, the why behind each ingredient, and WHY it was chosen to be used on wood to begin with. Should be an interesting show. I will also be doing a show on Homemade Southern Gumbo…so you see, a good combination, but definitely woodworking centered. Thanks for adding my Channel. Only a couple videos so far but I am aiming to do 1 a week every Friday. Is it possible to ad me to the list too? Hi, you missed my channel, its been around for a year and a half. it was called my woodworking world. now its called Willmore’s world. dont forget Into the dirtshop!! Can you post my youtube channel too? Hi, i just started my youtube channel sawblade projects.. maybe you could add me on the list. WHAT HAPPENED TO GRAHAM HAYDON’S YOU TUBE CHANNEL? How about Chris Salomone from Foureyes…that guy is great and so cute! Great idea that you have created a list. It’s interesting to see these stats in one location. So many great channels. I’m also glad to know that you will be staying on top and updating regularly. I only want to watch the people that work in metric. Imperial is the dumbest system ever. Hey…. Bartee Lamar MySaw channel Very new, but have a few followers. I have a YouTube channel that centers on woodworking, home hobby CNC, and cigar box guitars. I’d like to be added as well please! Add Driveway Workshop on there if you can, thanks! I’m not an expert woodworker but I work with it and try to put out some YouTube videos! Still building my channel and learning new things everyday! Hary man, you can also add my channel. I have a YouTube channel. It is Luther Tool Works. Thanks ???? i was surprised to see my channel on here its an awesome list some i have not see need to check them out ???? many thanks paul. Thanks for creating this list! Reaperwoodworks is mine. YouTube, Facebook and Instagram under the same name. Great list. I didn’t notice myself on there as Wm Walker Co. Bout to turn over 9k subs. Cheers! This one is in French. I have a woodworking channel: https://www.youtube.com/user/maquinasdemadeira 33000 subscribers. DOn’t know if you are keeping this up, but can you add Driveway Workshop? Hello I am so grad I have found this web page – I will be looking at some other channels.